In AMSSE, “Anti-spam/High Delivery Rate” means that we do our utmost to deliver your email into receiver’s inbox, not spam or junk folder. 1. AMSSE prevent you send the non-subject emails. Screenshot 1: how does our automated email sending software deal with the non-subject email. For automatic sending, this information will be logged FYI. Because the no-subject email will be treated as spam, so our future email sender request you must input subject for your email templates. 2. Provides you with the one by one made to send email to ONLY ONE receiver per time. Screenshot 2: obo field of our automated email sending software. Usually, filled many recipients in the [To], [CC], and / or [BCC] fields, and send the email in traditional way, may be treated as spam on many email servers/providers of the receivers. So we designed this VERY important feature for you, with one by one, your email will deliver to one recipient per time, it will greatly increase the success rate of delivery. 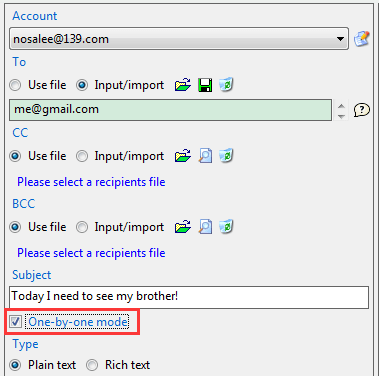 Screenshot 3: to schedule an email to be sent, specify or input the recipients first. Screenshot 4: save recipients to file, you can use it to schedule an email to be sent for next times. 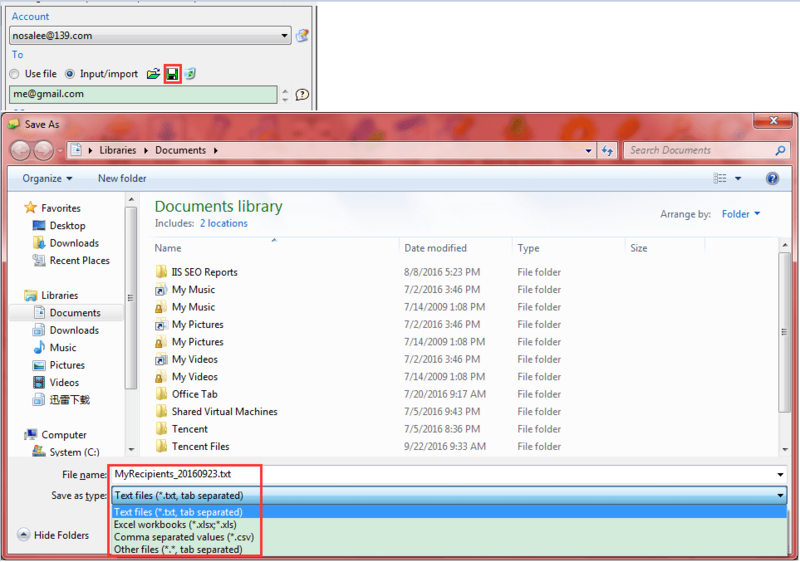 The supported file formats are: txt/csv/xls/xlsx as above screenshots. For the txt and csv files, no more words to say, because they are the plain text formats, each working fine program will process them well. 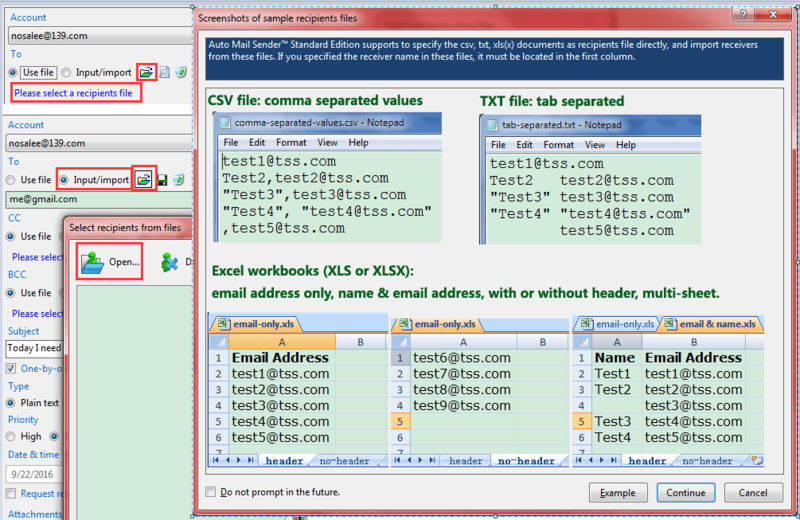 For the Excel documents (xls/xlsx), it not plain text, it is binary file, and has many extra formats except the text. After ten years of research, we invented a new algorithm for importing / exporting data from / to Excel documents. It is FASTEST in the world, even fast as using the plain text files (csv, txt). If you want to verify this, just compare the Excel importing/exporting function between our future email sender and other programs which have the this function. Download AMSSE to Do Automated eMail Sending!